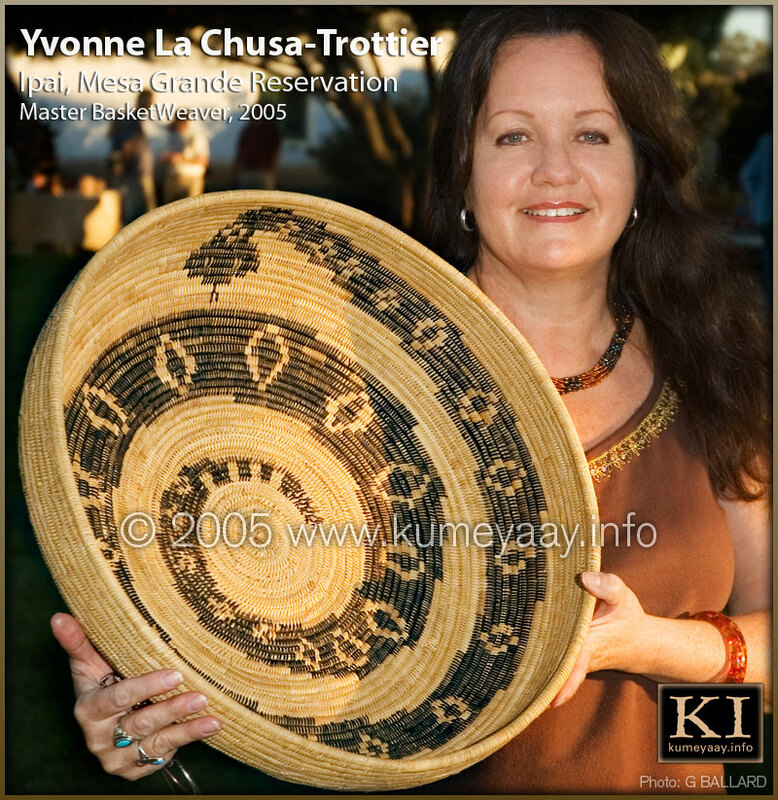 Yvonne La Chusa Trottier, Ipai, Mesa Grande Indian Reservation, works at the Shumup Ko Hup store and is an accomplished California Indian master basket weaver living in San Diego County, Southern California. "As an artist, I had always enjoyed painting and drawing as a child and have always been especially interested in Indian Arts, culture and the traditions of my own family as well as learning about other indigenous tribal cultures. 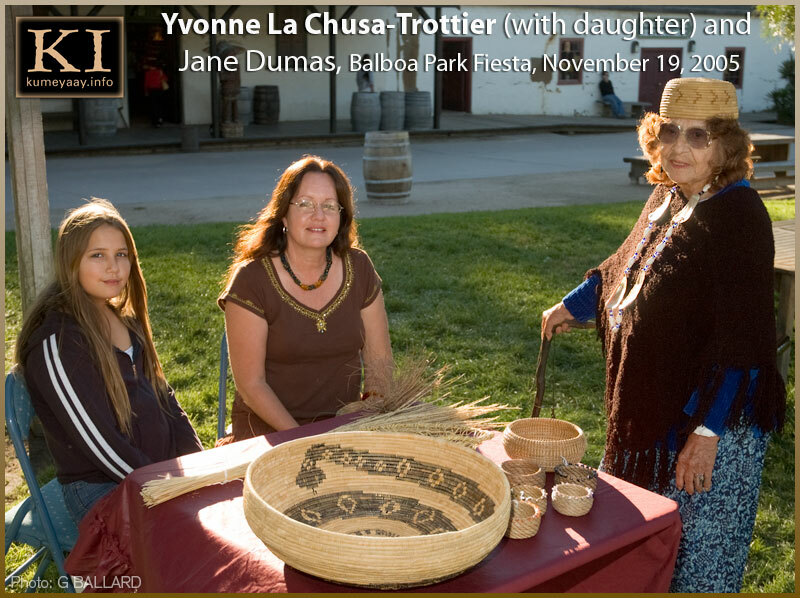 SAN DIEGO INDIAN COMMUNITY LEADERS  Yvonne (center) is pictured with her finished masterpiece Ipai Indian basket at her cultural booth with her young daughter and Jane Dumas (Kumeyaay elder) on November 19, 2005, during the 4th Annual Old Town San Diego Fiesta. "I was born in Escondido and have lived in San Felipe near Warner Springs, and also in the Anza-Borrego Desert before growing up in Spring Valley, California. While growing up, my family always traveled up to the reservation on weekends and holidays to visit and help my grandparents. My brothers and I spent many summers on the reservation with my grandparents along with visiting our other family members living on the reservation. "I am Ipai or also known as Diegueno or Kumeyaay and I am an enrolled in the Mesa Grande Tribe, which is near Santa Ysabel in the northern San Diego County. I now live in El Cajon and have continued my education in receiving an AA Degree in Art as well as an AS Degree in Drafting from Cuyamaca College. I have also received a Tribal Gaming, Culture and Policies Certificate from Grossmont College. "I have always been interested in tribal traditions and history that I chose to learn more about Native American history and the functioning of tribal government. I was also interested in understanding tribal sovereignty and what that means to me as a tribal member, not only for myself, but to my family, as a mother of nine children and two step-sons." Yvonne pictured hard at work at the Shumup Ko Hup cultural booth weaving the bottom of her famous huge rattlesnake juncus bowl during Balboa Park Culture Days (Powwow), May 15, 2005. "For the past three years, I have been taking Basketry classes along with my other college classes. I started basketry with learning to make pine needle baskets, and then expanded to learn about making the more traditional juncus baskets, which my grandmother, Grace La Chusa, made in the first half of the 1900's and my great-grandmother, Lenora Linton La Chusa, as well as my great-great-grandmother, Maria Jesusa Barker Helm Hyde, made in the late 1800's. "I have enjoyed the basketry classes I've taken with Justin Farmer, Abe Sanchez and the three semesters of basket weaving with Eva Salazar through Kumeyaay Community College. I have also learned Buffalo Drum making from Merced Maldonado of the Yaqui Tribe of Tucson, residing in Guadalupe, Arizona. I am also enjoying a third semester of Ethnobotany with Jane Dumas and Richard Bugbee at Kumeyaay College. "Through Indian Arts, I have been able to realize the richness of my culture and my heritage, thanks to the ongoing efforts of such great teachers that have chosen to carry on the teachings of our once almost lost Indian culture and heritage, along with the scarcity of materials now available to our indigenous basket weaving artists." 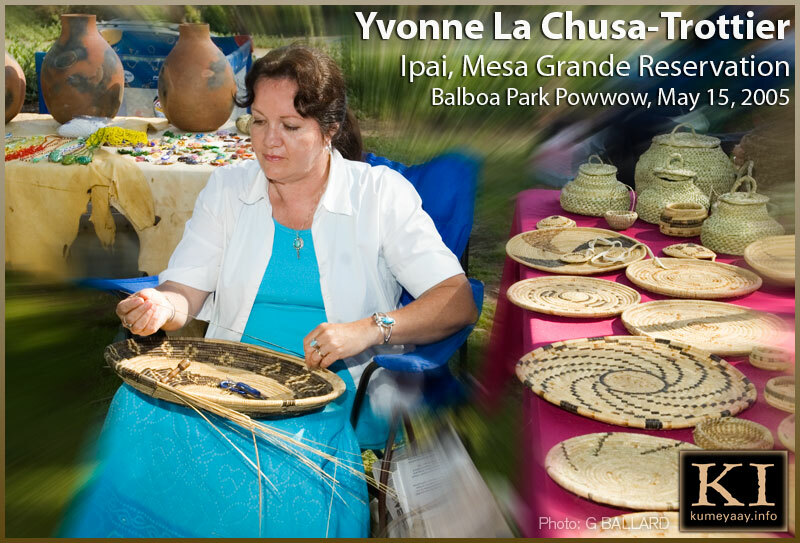 A supply of Yvonne La Chusa Trottier's Kumeyaay Ipai baskets and authentic Native American Indian crafts can be purchased from Shumup Ko Hup WEBSITE Indian store in Old Town, San Diego.